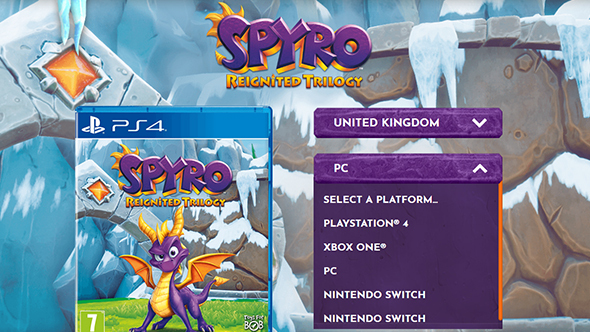 Update, July 19: Spyro Reignited Trilogy gets a premature PC listing on the official site. A PC edition of the Spyro Reignited Trilogy might be on the way sooner rather than later, if a new listing on the official website is to be believed. It seems to have been posted in error, but it does suggest the obvious port will be coming in the near future. Right now, the only confirmed editions of the Spyro Reignited Trilogy are for PlayStation 4 and Xbox One. The similar Activision-published revival, Crash Bandicoot N. Sane Trilogy, came to PC just last month, a year after the original console version launched. As such, we always expected Spyro to follow suit – it’s just a matter of when. Sate your nostalgia for now with the best old games on PC. The PC listing appears on the official website when certain regions are selected, including the UK. It’s either a premature listing, or a pure format error – the site’s nearly identical to the one for Crash, so there may be some old info getting copied over. We reached out to Activision for comment, but did not immediately receive a response. The company told us “We do not have any other platforms to announce at this time” around the original announcement. For fans of, er, other gaming platforms, these listings also point to a Nintendo Switch version of the game, which also briefly appeared on the Nintendo UK store a few months ago. That may not be relevant for PC players, but an announcement for both platforms could come at the same time. It’s a good week if you’re eager for Spyro info either way, as new bits of gameplay footage have been dropping as you can see below. Much like the Crash Bandicoot N. Sane Trilogy before it, this Spyro collection features all three of the original PlayStation games rebuilt from the ground up to look nice and pretty according to modern standards. With Spyro the Dragon, Spyro 2: Ripto’s Rage!, and Spyro: Year of the Dragon all included you’ll have over 100 levels to take you back to the heady days of mascot platformers. Spyro Reignited Trilogy launches September 21 at $39.99 on PS4 and Xbox One. 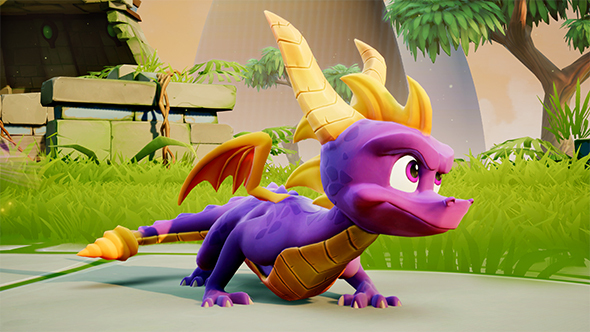 Tom Kenny, the voice of Spyro from the second game on, will return to voice the dragon here, and the original Stewart Copeland soundtrack will be “re-imagined” for the Reignited Trilogy.